I had a big New Year’s Eve gaming event and after we welcomed in 2014, we started off the new year with Euphoria: Build a Better Dystopia. A week or so later, I got in my first play of A Game of Thrones. The rest of the month was primarily gaming with my kids, particularly my gaming daughter. We got in a Glass Road, Russian Railroads, Steam Park, Scopa, Merkator and most excitedly ended the month with Caverna: The Cave Farmers. 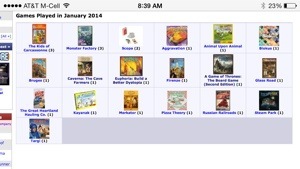 Total plays for the month were 24 – not too bad considering the lack of ” official” game nights!